We have our first native Andie’s Farm chicks!!!! The big pile of eggs our brooding hen has been nesting on for the last few weeks finally started to hatch! She was originally nesting underneath the shed, but I pulled her out and made her a secure nesting area in the old chicken coop due to May’s coyote invasion. 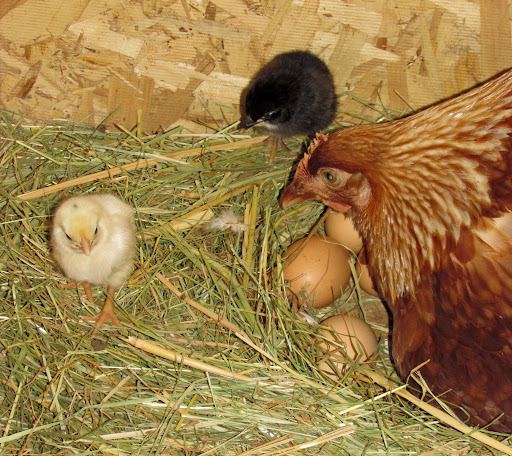 Of the 11 eggs, three have hatched; we have one black chick and two all-white ones. I’m not sure when the other eggs will hatch, since I don’t know when she started nesting in her hiding spot. 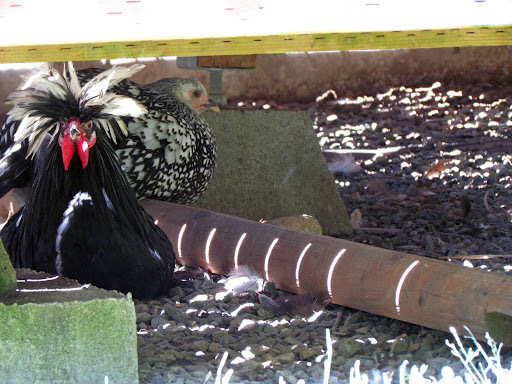 Broody chickens have the habit of wandering around looking for eggs, any eggs, then rolling them back to the nest, so I have no way to know if they were all laid on the same day. I can’t wait to see what they grow up into, since the odds are like 90% that Sean Paul or Marley is the papa. King Julian isn’t quite as amorous as those two, so I doubt he’s the daddy. I don’t even know which hen is the mama, since broody chickens don’t lay their own eggs, they just collect everyone else’s and then defend the nest. My plan is to let the broody hen raise them herself, since our brooding box is currently occupied. That means Gene has to spend the weekend customizing the new nursery area, since who wants to raise their chicks surrounded by feed cans and pitchforks? No, since these are the first ever “Andie’s Farm” breed of chicks, they need a properly decorated nursery area. A roosting area, dust-bathing area, and some greenery are definite musts. And obviously he’s going to need to find a new place for the feed cans. 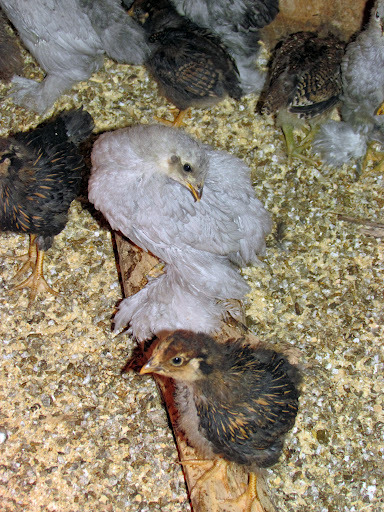 The brooding box chicks are starting to grow in their proper feathers, which leaves them looking like gawky teenage chickens. The Blue Cochins are especially funny looking, since they have huge plumes covering their legs. One chick in particular looks like she’s rocking a jumpsuit. I can’t wait to see what they look like fully grown. Blue Cochins are one of the heavier breeds, with the females weighing in around ten pounds. That’s a lot of chicken. Speaking of heavy critters, the pigs’ girth has reached an alarming size. They can still cram into the Pigloo, but just barely, and their feeding tub cracked in half due to their penchant for napping in it. 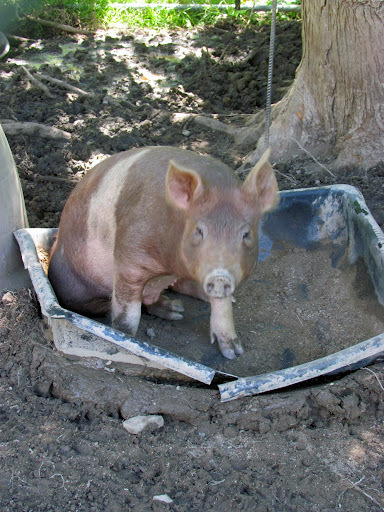 I would have thought something designed for mixing concrete in would have held up a little longer, but I guess it was just one pig too many. During the last few days, we had several torrential rainstorms, and the excess water turned the Swine Estate into a huge mud bog. The pigs are ecstatic, but wading through the mud to feed them is rather terrifying. You know that nightmare everyone has where you’re trying to run from a snarling monster but you can’t get your feet to move fast enough? That’s what wading through the foot-deep mud is like, except there’s three monsters and you’re not sleeping. The worst part is getting stuck in the mud, and having to throw the feed in the general direction of the tub to distract them long enough to extract your boots. As scared as I am of the pigs, going out first thing in the morning and seeing them sleeping in a huge snoring pile makes up for the terrifying drama of feeding them. Almost.